"This show in Johannesburg is viewed as the ideal platform for making awareness of Sri Lanka’s range of coconut products in the South African market to gain market entry with long term focus"
Sri Lanka has a specific organisation with almost half a century of experience promoting one of the country’s biggest exports: the coconut. Classified variously by experts as either a nut, a seed or a fruit, it is really a one-seeded drupe, according to botanists. 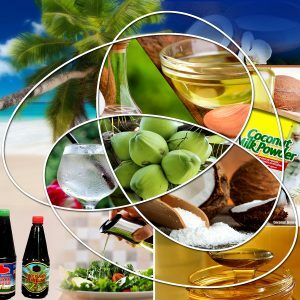 But it offers some of the most useful products in the world from supplying the beauty industry to confectionary, the coconut offers something unique. And the Coconut Development Authority of Sri Lanka (CDA) will be exhibiting at SAITEX 2018 , alongside Africa’s Big 7, in the Sri Lanka Pavilion, in Johannesburg from June 24-26. CDA and its exporters will display samples of Coconut Kernel products, such as desiccated coconut, coconut oil, virgin coconut oil, coconut cream, coconut milk, coconut milk powder, coconut flour, coconut water/ king coconut water, coconut vinegar, coconut butter, organic coconut products etc. The CDA sees four main objectives for its appearance at the event. The Coconut Development Authority of Sri Lanka (CDA) is the Apex Government Organization established in 1971 by an Act of Parliament of Sri Lanka to develop the country’s Coconut Industry. Its functions include promotion of coconut products in international markets, quality control, developing new processing technologies etc. CDA engages in promoting all coconut based products of Sri Lanka origin around the globe by participating in international trade fairs of repute. CDA via its Marketing Development & Research Division assists exporters/manufacturers of coconut based products by sponsoring them to showcase their products at international trade fairs/exhibitions and servicing them in many other ways to gain foothold in international markets. It is mandatory according to the provision of the Act that all exporters and manufacturers engaged in the Coconut Sector within the territory of Sri Lanka should register on an annual basis with the CDA. Different innovative Coconut Based Food Products which can be used during day- to-day life for healthy living. “These range from fillers, ingredients which can ease busy housewives/working professionals as well as customers who need natural products to enhance their beauty,” says the company. Wasula Herath, Assistant Director, Marketing Development & Research said: “There have been signs of import interests by South African buyers for coconut-based products of Sri Lanka origin during the past few years. As there was no representation of CDA in the past of promoting trading pertaining to coconut based products in South Africa, this isis viewed as the ideal platform for making awareness of Sri Lanka’s range of coconut products in the South African market to gain market entry with long term focus. Although Africa’s Big 7 (which runs alongside SAITEX) is mainly focusing on food products, CDA is of the view that clients visiting the event would be interested in coconut based products other than coconut kernel products which could be of useful to them. Therefore, CDA has planned and to carry out awareness campaigns of coconut based non kernel products of Sri Lanka origin.